Used to create business registries that catalog companies, the web services they provide, and the corresponding URLs for their WSDL contracts. A standard for creating discovery documents that provide links to multiple web service endpoints. This standard is Microsoft-specific and will eventually be replaced by a similar standard named WS-Inspection. Used to create an interface definition for a web service. 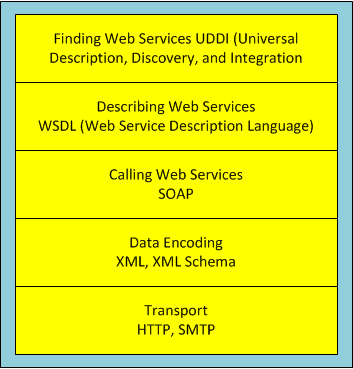 The WSDL document tells a client what methods are present in a web service, what parameters and return values each method uses, and how to communicate with them. The message format used to encode information (such as data values) before sending it to a web service. The protocol over which all web service communication takes place. For example, SOAP messages are sent over HTTP channels.